Fabio Borini is a frustrated centre-forward. Still, at least it is an improvement on being a frustrated footballer. The Italian, on loan from Liverpool, sees himself as a central striker but it is a position he has started just once in for Sunderland, at West Bromwich Albion in Paolo Di Canio’s last game. That is the glass half-empty story. On the plus side, Borini is fast becoming a constant in the Black Cats’ ever-changing forward line. With neither able to score goals at present, Jozy Altidore and Steven Fletcher are almost taking it in turns to be Sunderland’s No.9. Even Adam Johnson has been unable to nail down a regular place, although his performances last week should ensure the right-wing slot is his for a while. Emanuele Giaccherini, a much-heralded full Italian international with a Scudetto to his name, remains a bit-part player. In the euphoria of victory at Fulham on Saturday, Gustavo Poyet declared the 11 which started to be more or less his preferred side. For the eighth time in the last 12 matches, Borini had been part of it. For a player whose professional career is yet to really get going, it is a significant step forward. The next will be to add the goals which can ensure he gets to play where he wants. Despite being only 22 years old, Borini is already on his sixth club. He is yet to make 25 appearances for any of them. “Eleven players have to play, seven on the bench. Only 14 will play maximum (in any given game),” he stresses. “You have a point to prove when you are not in the 11. That gives you the extra desire to play the games. Di Canio seemed very lukewarm about Borini – 19 minutes against Arsenal was the sum total of his pre-West Brom involvement – while his caretaker replacement Kevin Ball was a much bigger fan of Giaccherini. Poyet, though, has been won over. So have the fans. 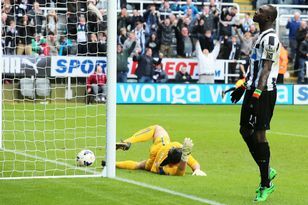 It helps that the rare occasions Borini finds the net – against Newcastle United, Chelsea and Manchester United – are the big ones. It also helps that he works harder than his rivals to play wide in Poyet’s front three. After seeing his career disrupted by injury – most notably last season’s dislocated shoulder – more than anything he just needs a run of games to show what he can do, not least to the club which still owns him, Liverpool. “The first objective of the season was to get on the pitch every week,” he says. “I still have objectives to achieve, like scoring more goals. To play in the big teams like Liverpool, you don’t just need to perform well. “As a striker you need to score goals. That’s the next step. As a striker you can perform well, but at the end of the season people count your goals. “I needed to prove to myself first that I can play here because I have never had a long spell playing in England. I have always been in England but I have never had a long run of games. Despite what he says, it is hard to see Borini getting his wish of playing down the middle. For all that Poyet speaks of liking to play with two centre-forwards, his actions as Sunderland manager prove otherwise. The Uruguayan’s way of playing is a 4-1-2-3, and despite his technical ability and work-rate, Borini is too lightweight, both physically and in terms of his goal return, to be the middle man of the forward line. The arrival of Argentinian Ignacio Scocco, if it happens, will only reduce the chances further. A career as a second centre-forward is a possibility, but Borini’s destiny looks like that of a wide forward, certainly if he stays in England. Much as he enjoys life in the North East, this season-long loan is nothing more than a career move for Borini. With a long-term contract at Liverpool, Borini is here to show his worth to the Reds manager, Brendan Rogers. “I like the lifestyle here, the people and the stadium,” he says. “Football is huge. I like it here. I can relax when I go home and I don’t have to stress about being seen or stopped by people (he does not live on Wearside). I can live a normal life. “It’s nice when you get to the stage when you lose or win that people are still happy to see me. “That helps my confidence stay high. I will finish my season here and then after that I will got back to Liverpool because that is my contract. Things are written on paper so that’s the thing. To achieve that last goal, Sunderland will have to improve on their home form, the worst in the division. Three of the next four league games are at the Stadium of Light, where the Black Cats have kept their best performances for the cups. “I don’t understand the reason why,” Borini admits. “At home the fans want us to get forward and win games. “They need us to push like English football has always been. Sometimes the fans want different to what the manager wants.